Kathmandu, the capital city of Nepal, is named after Kasthamandapa, a wooden temple constructed from a single tree in 1596. 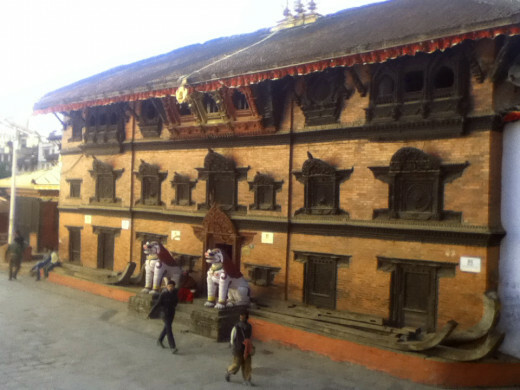 Kathmandu, a monument of wood, was called Kantipur, the city of glory, in the ancient time. It is believed, Kathmandu was founded in 723 AD, however, the oldest stone idol in Kathmandu dates back to 4th century AD. In antiquity, Kathmandu was called Nepal, the land protected by a sage called Ne. Later the provinces dominated by the kings of Kathmandu were called Nepal. Nepal and her king have been mentioned in the Hindu Epic Mahabharata. 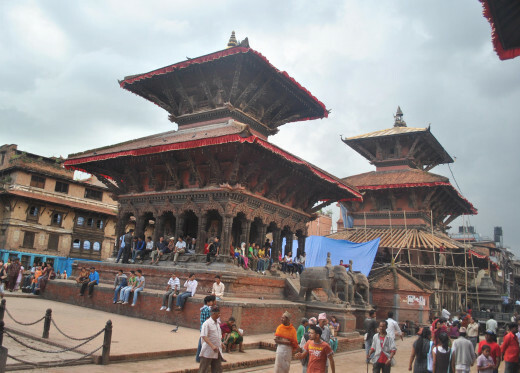 Kathmandu Durbar Square, Durbar Square Patan, Living Goddess Kumari are some of the tourist attractions in Nepal. There are over hundred places to visit in Kathmandu. 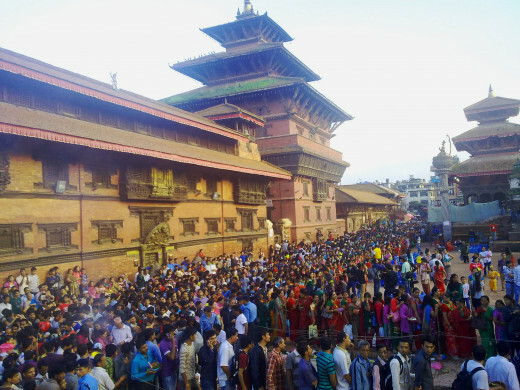 Kathmandu Durbar Square is also called Hanuman Dhoka Durbar or Basantapur Durbar. 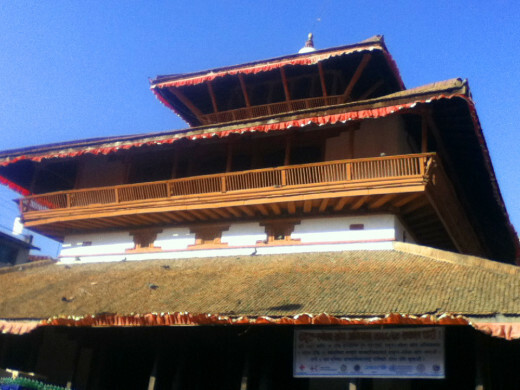 Adjacent to New Road, Kathmandu Durbar Square is 30 minutes walk from Thamel, the major tourist hub in Kathmandu. 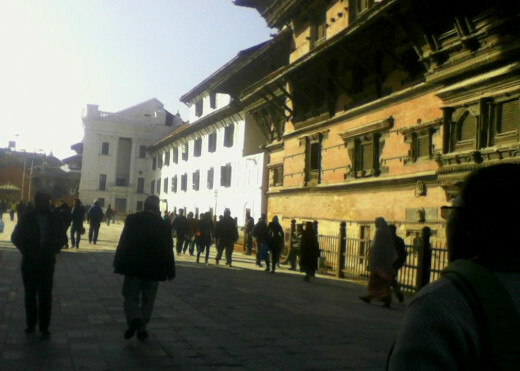 If you are in the Kings’ Way, it will take you 25 minutes to reach Kathmandu Durbar Square. 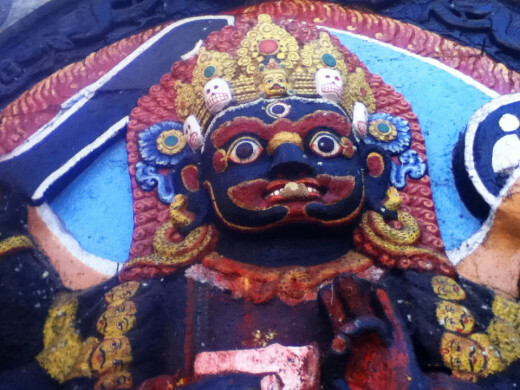 It is highly recommended that you visit Goddess Kumari and the Hanuman Dhoka Museum in Kathmandu Durbar Square. As you enter into Kathmandu Durbar Square from New Road, you will come across Nautale Durbar, the nine-storied pagoda style palace of King Prithvi Narayan Shah, the founder of modern Nepal. It was built in 1768. Adjacent to Nautale Durbar is Gaddi Durbar, the European style throne palace built in 1908. On the left side is Kumari temple, the house of Living Goddess Kumari. If you are lucky, you can find the Goddess looking through the window. If you want, you may enter the temple and pay respect to the Goddess in human form. 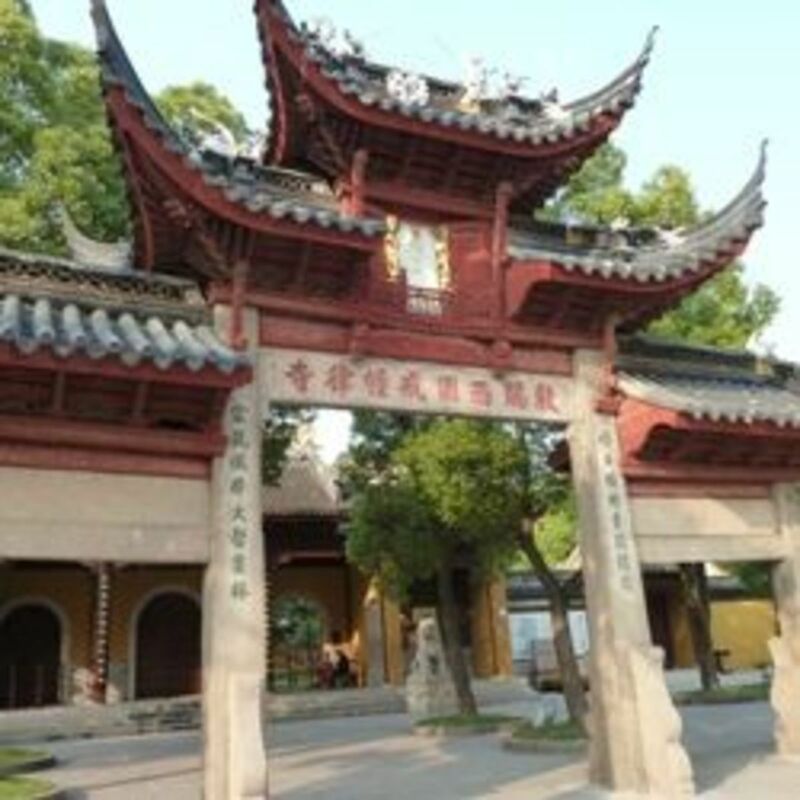 The exterior of Kumari temple is ornately decorated with wood carvings, and the mighty stone lions guard the entrance. The interior is adorned with Hindu and Buddhist symbols and idols of Hindu and Buddhist deities. The temple was built in the 18th century by the last king of Malla dynasty. If you walk few meters west of Kumari temple, you will find Kasthamandapa. 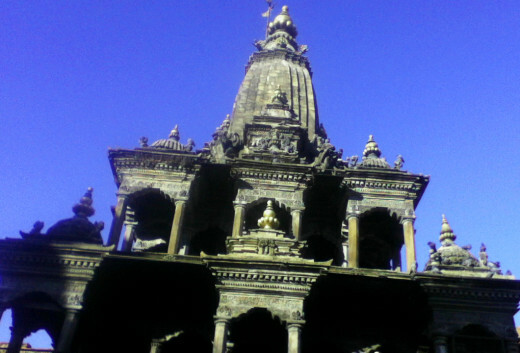 It is a three storied pagoda styled building, with the idols of Hindu God Ganesha installed in the four corners and Gorakhnath, the founder of Nath cult, in the center. 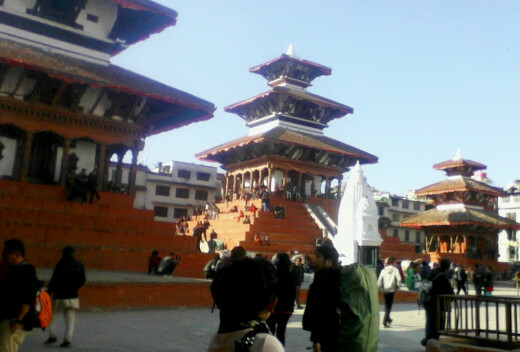 There are many temples in Kathmandu Durbar Square. 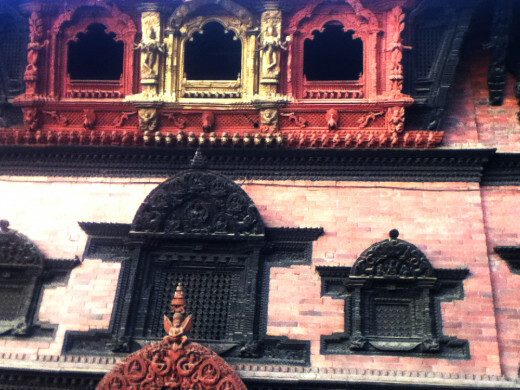 You can climb one of the temples, if you like, and see the entire Kathmandu Durbar Square. Walk along the white European style palace and turn right. You will be standing in front of Hanuman Dhoka Durbar. It was the palace of medieval kings which has now been restored as a museum. When Nepal was a kingdom, the Kings were crowned in Hanuman Dhoka Durbar. 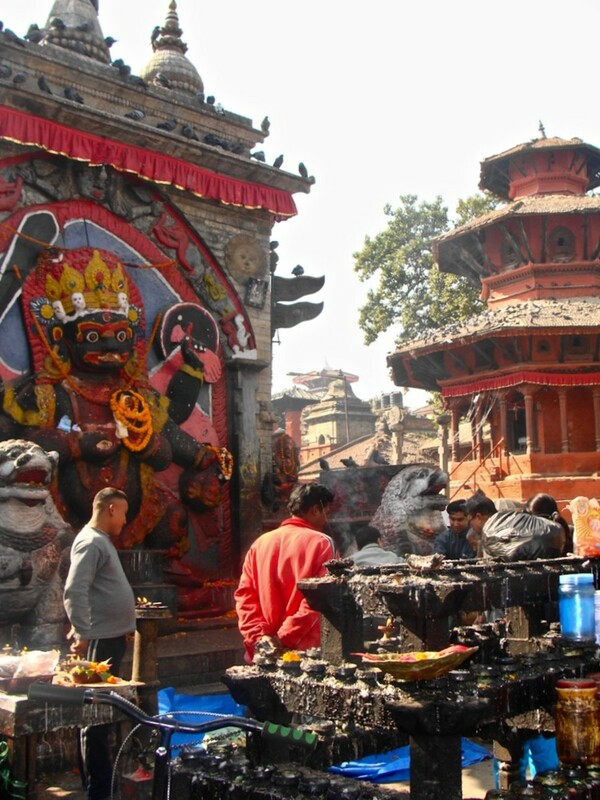 There are many temples in the proximity of Hanuman Dhoka, the most famous are Taleju built in 1564 and the 17th century Kala Bhairava. Before 1950, government employees had to take the oath of office by touching the idol of Kala Bhairav. Hindu Goddess cult is very popular in Nepal. Kumari is a girl of 3 – 12 years worshiped as the Living Goddess. She is equally venerated by Hindus and the Buddhists. In the past, every year Kings worshiped Goddess Kumari and got approval to rule the country for the following year. Now this tradition has been transferred to the President. Placing forehead on the Goddess feet is the part of Kumari worship. According to the legend, in the middle ages Goddess Taleju visited the kings of Nepal in human form. Taleju is the Nepali name for Goddess Durga. One evening, in the 16th century, the then King Trailokya Malla was playing dice with Taleju. When the king was overcome with desire, the Goddess vanished. Realizing his mistake, the king performed worshipping. She then appeared in his dream and instructed him to choose a young girl and install her as her representative. 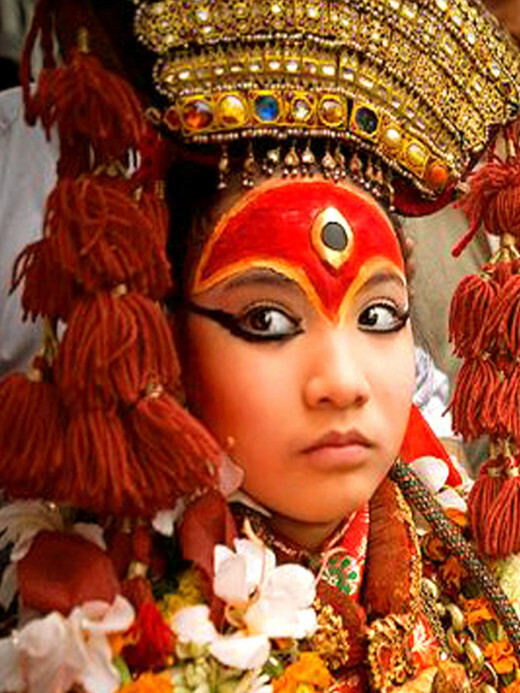 The tradition of installing a girl in Goddess Kumari form is strictly followed in Nepal. After rigorous rituals, a young girl from Shakya clan is chosen as Goddess Kumari. When Kumari shows signs of puberty, she is replaced by another girl. After the retirement, former Kumari settles in her normal life, even gets married. 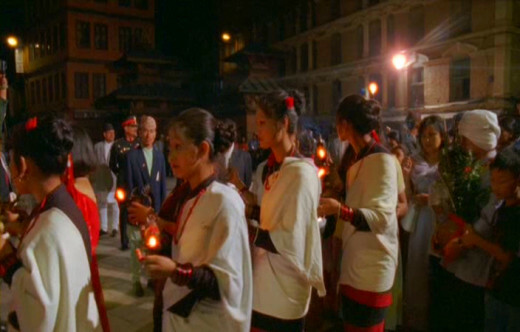 Even though the tradition of Kumari began in the 16th century, there are early references in history when kings in Nepal worshiped a young virgin girl as Goddess Kumari. The cult of Kumari in Hinduism is very old and dates back to Indus valley civilization (2500 – 1500 BCE). City of Patan is couple of miles south of Kathmandu. Patan is renowned for wood carvings, stone sculptures, gilded statues and tantric paintings. 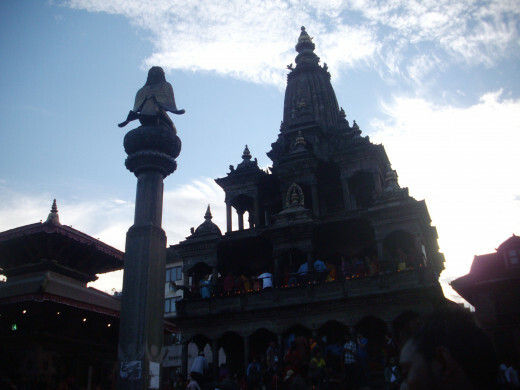 Though not the main part of Durbar Square Patan, there are many must see temples and monasteries in Patan. Ashoka Stupas: four Buddhist temples built by Ashoka in 250 BCE. Patan was established as a city in 299 CE. 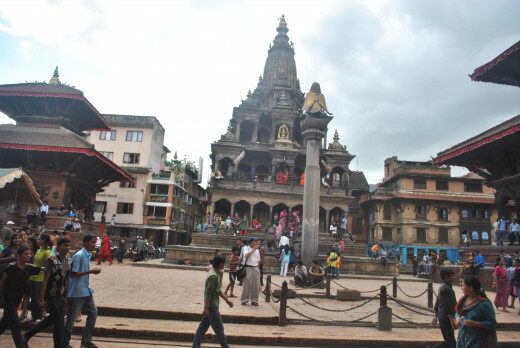 Ancient name of Patan is Lalitpur, which means the city of beauty. Patan is indeed beautiful with ornate wood carvings, stone sculptures, gilded statues, old palace, temples, monasteries, rest inns and natural springs. In ancient Nepal, every city had an entrance gate. Patan Dhoka-gate is the only surviving gate. When you enter the gate and walk into convoluted lanes for 7-8 minutes, along temples, monasteries, rest inns, artists’ workshops, old houses with intricate designs, you will reach Durbar Square Patan. As you walk into Durbar Square Patan, you can see the 17th century palace and a stone pillar where a king of Patan sits bowing to his guardian deity Taleju installed inside the palace. The exterior of palace has intricately carved wooden windows, doors and eaves. On the doors there are replicas of Hindu deities and engravings of Hindu and Buddhist symbols. The entrance of the palace has gilded door and gilded window just above it. The palace in Durbar Square Patan has now been converted into a museum, where you can see the best wood and stone works in the country. The royal bath, inside the palace, is one of the finest examples of craftsmanship. 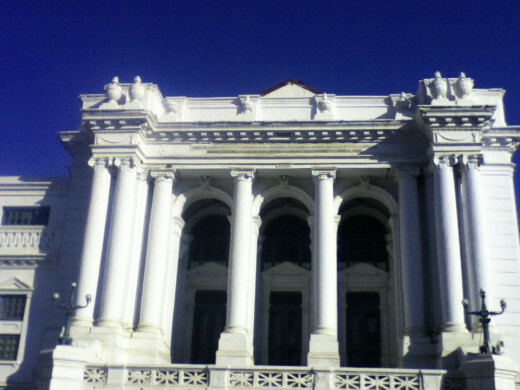 It features magnificent stone artistry. Most of the architectural designs in the palace belong to 16th and 17th century. 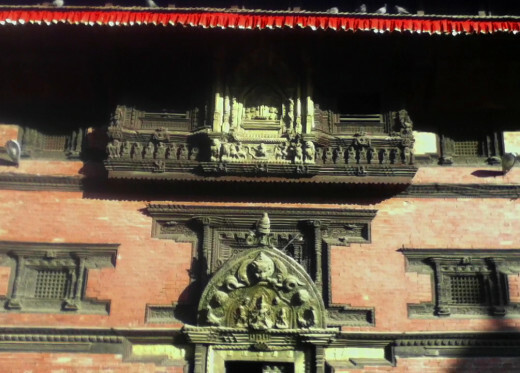 In the Durbar Square Patan you can see a 21 pinnacled stone temple of Hindu God Krishna, which was built in 1635. Idols of Krishna and his consort Radha are installed in the temple. The walls of the temple are engraved with the scenes from Hindu Epic Mahabharata. Just in front of the three storied temple, Garuda, the carrier of Lord Vishnu is perched on the top of stone pillar. It is highly recommended that you also visit the temple of White Machhendra, which is in the proximity of Durbar Square Patan. Boudha is one of the most sacred Buddhist temples in Nepal. Late afternoon is ideal time to visit Boudha because you will see few tourists but many locals lighting butter lamps, circling the temple, burning incense, and rotating prayer wheels. Visiting Boudha in full moon evening is highly recommended, you can see the vicinity lit up by thousands of butter lamps. 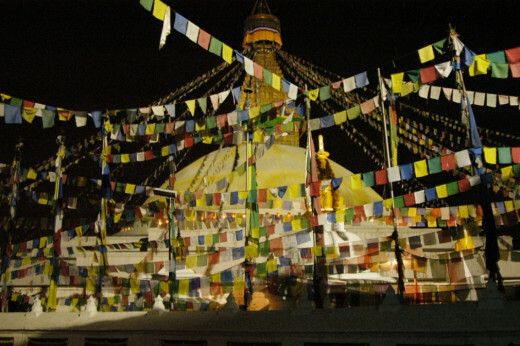 Swayambhu is a Buddhist temple on the hill, in the southern part of Kathmandu. Swayambhu is a whitewashed dome structure with gilded spiral and painted Buddha’s eyes. You can see the entire Kathmandu from Swayambhu. Pashupatinath is a Hindu temple dedicated to Shiva. Non-hindus are not allowed inside the temple, but you can stroll in the proximity. Pashupatinath is in the eastern part of Kathmandu and on the bank of Bagmati River. The river bank is also used as open air crematorium. In Pashupatinath, you may watch corpse burn all the while thinking about life and death. Perhaps, you could experience spiritual upliftment! Visiting Pashupatinath during Shiva Ratri festival is highly recommended, you will see hundred of naked devotees of Lord Shiva. 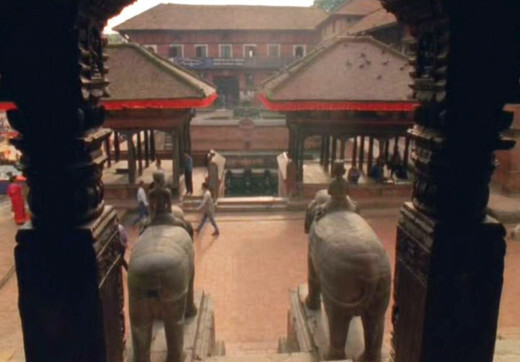 The city of Bhaktapur was founded in 889. It is about 5 miles east of Kathmandu. 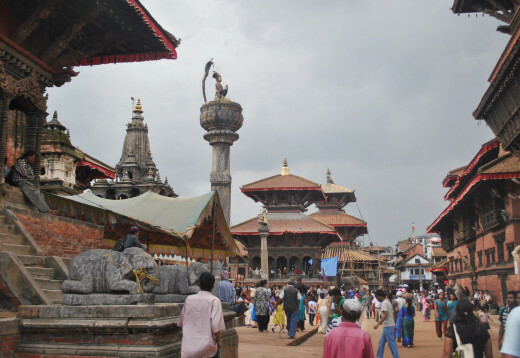 There are numerous temples and palaces in Bhaktapur Durbar Square dating back to 16th and 17th century. 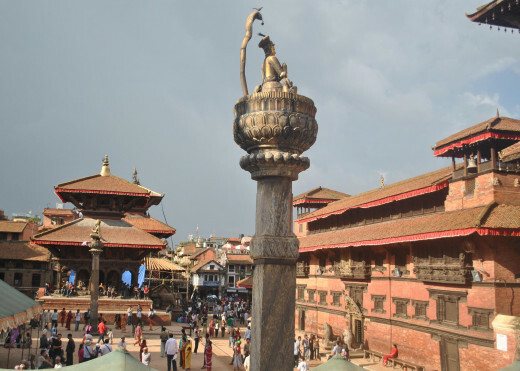 Some of the attractions of Bhaktapur Durbar Square are: Siddhi pond, Golden Gate, 55-windowed Palace, Bhairava temple, Bhimsen temple, Nava Durga temple, Nyatapola Square, and Dattareya Square. Changu Narayan temple is three miles north of Bhaktapur which was built in 323. Built in 1970, Narayanhiti Palace was the official residence of Kings of Nepal. It covers 74 acres of land. After the King was overthrown in 2008, Narayanhiti Palace has now been converted into Narayanhiti Museum and the Ministry of Foreign Affairs. In 2001, the then Crown Prince massacred the entire royal family – including his father, mother, brother and sister – inside the Narayanhiti Palace before committing suicide. The building where the royal massacred occurred was demolished by the last king of Nepal, the uncle of Crown Prince. Narayanihiti Palace is in King Way (also called Durbar Marg). Some of the country’s best 5 star hotels are in Kings Way. There are curio shops, shopping malls, restaurants and delis (including KFC). National Museum, in Chauni, is close to Swaymbhu. 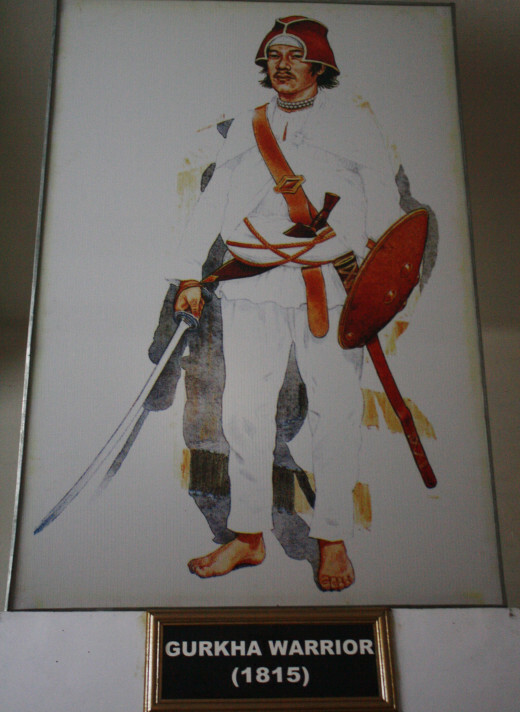 It showcases extensive collections of weapons that Nepal used while fighting with the British, Chinese and Tibetans, in the 17th and 18th century. You can even see the jeep gifted to the King of Nepal by Adolf Hitler. Natural History Museum is in the walking distance of National Museum. 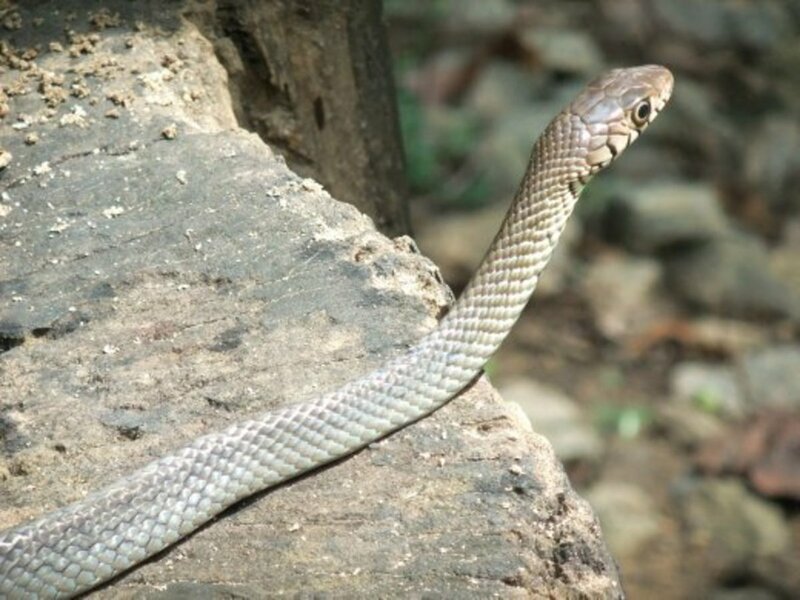 Different species of insects, amphibians, mammals, reptiles, and invertebrates are collected in the museum. Natural History Museum showcases specimens of extinct species and prehistoric invertebrates. Natural History Museum in Tribhuvan University is famous for its stuffed animals. It is in Kirtipur, few miles south west of Kathmandu. 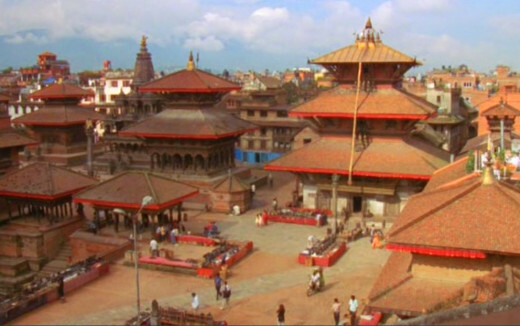 Kirtipur also has a durbar square. There are numerous theaters in Kathmandu. Some of the regular theaters are Gurukul, Mandala, Naga, and Sarvanam. They all run regular shows. 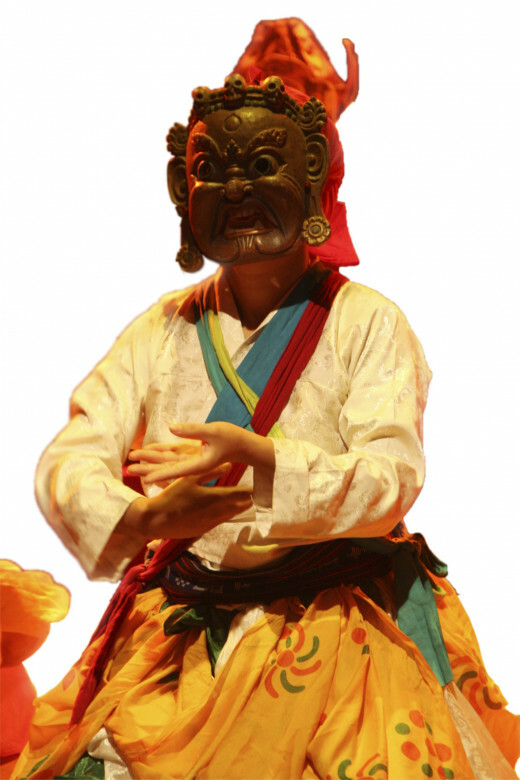 Gurukul organized Kathmandu International Theater Festival in December, 2012. You can watch a movie in Kathmandu in just three bucks. Jai Nepal, Kumari, Big Cinema, QFX Central are some movie theaters and multiplexes in Kathmandu. Do you want to visit Kathmandu? I have visited, and I loved it. I’m intrigued, I will love to visit. I have other travel destinations in mind. 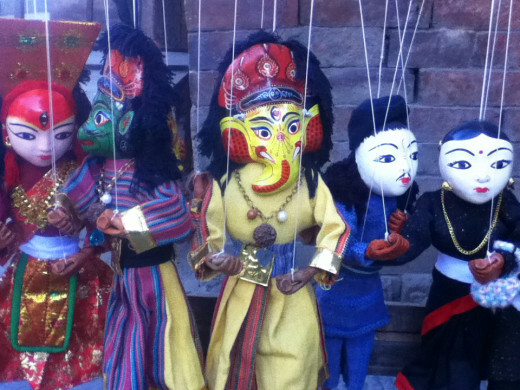 Kathmandu is famous for the public performances during the festivals. Throughout the year rulers and the ruled come out in the public squares to watch dance-drama, chariot processions, and worshiping of deities. 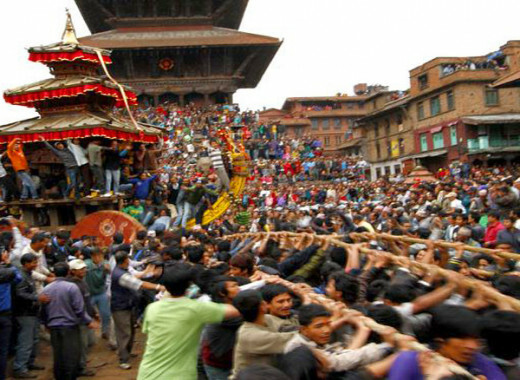 If you are in Kathmandu, it is highly recommended that you watch Indra Jatra, Machhendra Jatra, Bhote Jatra and Gai Jatra. In Kathmandu, it is more likely that you will be staying in Thamel area. 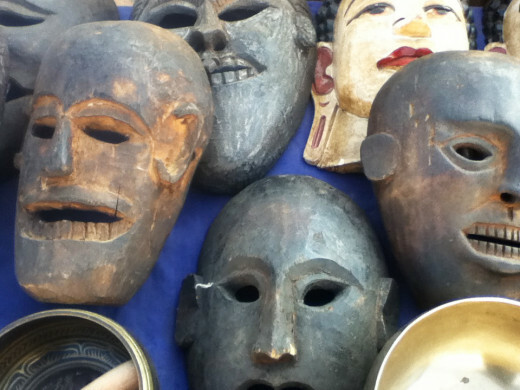 Thamel is famous for budget hotels, restaurants, bars, gift shops, book stores, art galleries. 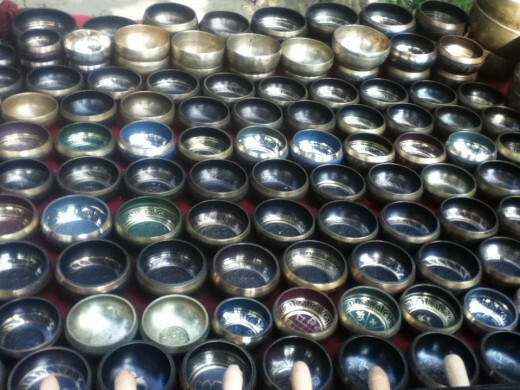 In Thamel, you can find anything from mountain gear to Nepali spices and gems shops. Himalayan Java: In Java, you can drink coffee and tea either in European of Nepali flavor. Rum Doddle Restaurant and Bar: Reviewed in Time Magazine as one of the world’s best bar, Rum Doddle is one of the best place to enjoy good food and drinks, and listen to live music. Jatra: One of the finest pubs in Kathmandu offers live music on Fridays and free drinks to ladies on Wednesdays. Nafa is the best place to see Nepali paintings. Here you can see the world’s longest painting by a single artist in a single day. so nice .......... informational posts. Thanks for always supporting me. Have a great weekend. This is an award winning hub ..congrats ! I'm glad you liked this hub about the place I live. Thanks for appreciating my works. What a well deserved selection of Hub of the Day, Vinaya! As usual, I feel as though I have gone on a wonderful tour with your detailed work and photography on Kathmandu...You have an interactive and most interesting writing style. Voted UP and UABI. I'm glad that you enjoyed this virtual tour. I expect you to make real travel, if you can. Congrats on your hub making the big time. Enjoyed the tour of Kathmandu. Fantastic pics and video. Passing this on. Thank you my dear fellow writers for being with me in this journey. I'm overwhelmed with your wonderful comments. I would not be here without your tremendous support. Congrats on winning the HOTD award Vinya Ghimire! Well deserved HOTD. I enjoyed all the pictures you took to illustrate the interesting places to visit in Kathmandu and very handy to have your personal recommendations for anyone travelling in the area. What an awesome Hub Vinaya! Beautiful music and video and I loved the photos! Congrats on a well-deserved Hub of the Day! Up and shared! Super, dude! Great video. Good descriptions and feel for the culture. Congrats on winning the HOTD award Vinya! Congrats on HOTD, truly well deserved, this is stunning work! What information you have included, so much great info for anyone going there. Your time guide is a great idea to include for each sight too. The traditions, history and customs are fascinating and Nepal and Kathmandu I would love to visit. My young niece of 16 years old visited last year for 2 weeks to help in villages there and loved the people, culture, everything. Voted everything, shared and pinned, great work! Congratulations on the HOTD award. You deserved it. This is a well written and a very informative hub with lots of inviting photos. Thanks for sharing your culture to us. Have a lovely weekend! Congratulations on a well deserved Hub of the Day! I love learning about your culture! What a beautiful article about the highlights of this intriguing city. The video is awesome. It has been my desire to visit Nepal and Kathmandu for some 3 decades! Yes, one of these days I will knock on your door, lol Thank you for an awesome hub and Congratulations on the HOTD. wow. impressive work on this hub. I enjoyed it, and it was very informative -- voted way up! Wow! What an extremely informative & well-written hub with beautiful photos and video! I enjoyed the virtual tour of Kathmandu. This hub showcased both your inimitable writing talent and incredible photography skills. Congrats on winning the HOTD! Way to go! Thank for taking this virtual tour, I hope it was a pleasant experience. I welcome you in Kathmandu. You have written well taking lot of strain. I enjoyed it and carry plan to visit Katmantu in near future. I will have a copy of this article when I reach your land. Congrats on your achievements in HP. I hope you enjoyed this virtual tour. Thanks for being here. Hi Vinaya thank you so much for taking me on such a beautiful and interesting journey. @DDE, I will love be be your tour guide. @andromida, thanks for taking the virtual tour. @Jools, thaks for appreciating my work. Thanks for your comment. @Xstatic, Nepal is now a republic. I'm sure you will love Nepal. @Jamie, Thanks for your sincere comment. I hope the virtual tour was pleasurable. This Hub is just so beautiful. I could never pronounce the names of all the places you mentioned, though. I love "Tom and Jerry's" Club! Beautiful photos. I would love to visit Kathmandu some day. What a great piece of work! You have such detail here that I am sure I could use it as a guide to that beautiful city. It sounds a like a wonderful place to visit. Michael Palin, British actor, has done a series we are currently watching on NPR about visiting Nepal, India and going into the Himalayas. He had a short audience with the King of Nepal ( I think) and even got to meet and speak with the Dalai Lama. It has been fascinating to watch and was done for BBC, I believe. Interestingly too, the Dalai Lama will appear here in Eugene, Oregon soon on one of his many journeys. Vinaya, amazing hub! Love all of the colourful photos, it looks like a truly intriguing and interesting place. Loved the music on the video too! Gorgeous architecture and colorful people. hope to visit your place in the coming years. Most beautiful and so different you have described these places from the heart, and I would love to visit soon. @Billy, you learn from me and I learn form you. This is what humanity one world is about. @Rosemary, I'm always tempted to tell about my part of the world. Thanks for taking interest in my stories. @Peggy, I always take inspitation from you while writing travel article. @Jackie,thanks for taking the virtual tour. @Prasetio, thanks for taking interest in my part of the world. @fpherj, I hope the virtual tour was pleasant. @blaise, thanks for appreciating my works. You have some amazing photos that really bring out the beauty of Kathmandu. Yes, I would love to visit some day. Well done! I think Kathmandu is a very beautiful city with many attractive places to visit and I like the video which gives more visual description about Kathmandu. Very informative hub. Kathmandu is a beautiful city. How lucky I am to have found this article from you. I really enjoy all the pictures as well. Thanks for writing and share with us. Voted up and Take care! What a beautiful and informative hub. The music was a surprise and wonder, surely spiritual inspired. I loved it all. Wow! What an amazing place! Kathmandu would take a vacationer some amount of time to see everything that you have listed here as worth visiting. Good job on that video at the top and loved all of your photos. Those temples are amazing! I really liked learning about this part of the world from this most excellent hub of yours. Voted up, useful, beautiful and interesting. Will be happy to share this with my followers. You did an wonderful job here Vinaya. You are truly a great embassador for Nepal. I love to read about the legends and the traditions that grow from them. The story of Goddess Kumari is a fascinating one. I love hubs like this one where I can learn about other cultures, and you did a great job of showing us so much about this city. Thank you Vinaya.